Highlight your individuality with this exclusive saree pin brooch gold plating on it gives it a brilliant look making it a classic. Highlight your individuality with this exclusive saree pin brooch . Alloy serves as the base for this creation and the gold plating on it gives it a brilliant look making it a classic pick. 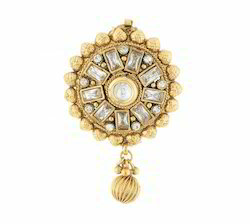 Embellishments like White kundan beads bring out the best in this stunner. Designed to work well with a range of outfits. Truly a brilliant and a must-have addition to your jewellery collection.